Grizzly bear 399 and her daughter 610, both of whom have now had many cubs, and some of which made it to adulthood, are the subject of Grizzlies of Pilgrim Creek. At Amazon.com, it has a somewhat different title due to apparent publication disagreements, but it is the same book. 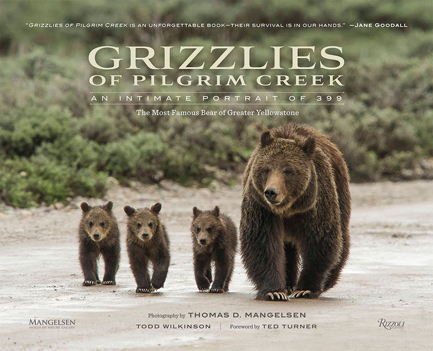 Be that as it may, this coffee table book has many stunning photos from famous wildlife and wild country photographer Thomas D. Mangelsen. He has followed the bears with his cameras for about as long as 399 has lived in Jackson Hole. The text comes from Todd Wilkinson, environmental journalist and author of twelve books. You can order an autographed edition that also includes an original fine art print autographed by Tom Mangelsen with a matching edition number at this website. This book is packaged in a protective clamshell-style portfolio case. Getting to the book’s information, the front has a “Bear Family Tree,” beginning with 399, born in 1996. Her daughter 610 was one of a litter of triplets born in 2006. 399 has had three sets of triplets! Of these, four are probably still alive, with only 610 known to have her own offspring. 610 herself has had 3 litters, consisting of a single cub and two sets of twins. Three of these five are thought to live, but all are unnumbered (no radio collars). You can see how difficult it is for a grizzly bear to reproduce herself with an another adult, fertile female. These two grizzlies are so well known because they frequent the roadsides of Grand Teton National Park and people get to see them. The bears’ habits seem dangerous because people frequently kill easily visible bears. On the other hand, cubs and adult females too are in danger from adult males away from the roads. Some these bears’ cubs fell to attacks by boars. The big males tend to stay back from the roadside. 610 and 399 have proven skilled in keeping safe and tolerating people near the roads. If the grizzly is delisted and there is a hunting season, it seems almost certain that these roadside bears will be killed even though there would be no hunt inside Grand Teton N.P. Don’t take the term “roadside” or “park bear” too literally. They cross out of the park onto the national forest or the National Elk Refuge and private land. The bears often den in Pilgrim Creek, deep in the Teton Wilderness, a safe winter place due to the Wilderness Act and complicated terrain. Stunning – those little triplets are sweet. Thanks! The thought that it is more important to have a trophy hunt than to protect these magnificent bears is quite sad. I’m glad the world is watching. I had the oppertunity to see this bear & her 3 cubs in October of 2013 in Grove Venture. Please tell me how to get a copy of your book. Long live The Wildlife News. The best site for analysis for wildlife conservation issues in the West! ups just dropped off my copy. Some of the best $$ I’ve ever spent. A full size print of the cover photo of grizzly 399 and her 3 cubs would cost $100, I’d estimate. Everyone loves to look though it. I think then they buy it. Mangelsen and Wilkinson brought their roadshow (in conjunction with the Sierra Club’s “Our Wild America” campaign) to the UM campus in Missoula Monday night. It takes a lot to get me in the mood to drive to Msla (especially on a cold night) but it was so worth it. They filled a very large lecture hall and latecomers ended up sitting in the aisles. Some of their main points: Grizzly food sources are in flux and we can’t yet know how this will play out for the bears on down the line; hunting looms as a large threat in the three states; connectivity and expansion are issues still to be addressed in the Greater Yellowstone Ecosystem. Population numbers alone shouldn’t drive something so complex as grizzly survival–ALL variables have to be considered and a precautionary approach, rather than de-listing, should be taken. These photos are striking, not just for beauty (bear family in field of lupines) but for poignancy (bear family in a field of automobiles). I came across an awesome book in eco-fiction I call it, entitled “The Tusk That Did the Damage”. The title just amazed me.